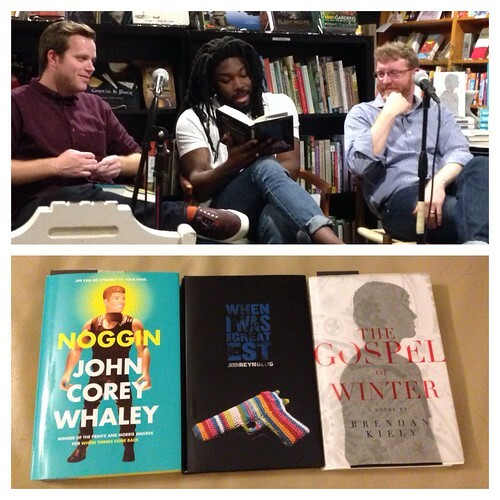 Last night I attended an event at Literati Bookstore in Ann Arbor that included authors John Corey Whaley, Jason Reynolds, and Brendan Kiely. All three of them talked about their current books, read for a bit, and then answered questions.They were very conversational with the crowd and so it felt like we were just sitting around talking in a living room together rather than attending a reading at a bookstore. More importantly, each author made me want to immediately read their books as I listened to them give background about the story and characters, and then read a snippet from the book. After their talk, I went up to get books signed from all three authors, and as I was talking to Jason about the intriguing cover of When I Was the Greatest (which I happen to love), he mentioned that the cover is actually preventing his book from getting into schools due to zero tolerance policies (you know the ones -- where kindergartners who point their finger to mimic a gun get suspended). Nevermind that these people doing the censoring haven't even read the book. The fact that there's a gun on the cover makes it nonnegotiable. So I decided, in some small way, I want to do something to help get this book into schools. 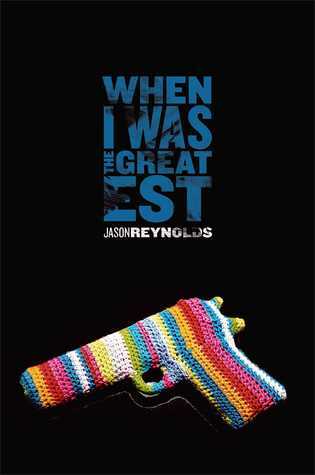 This is what I propose: I am going to give away a signed copy of Jason Reynolds's book When I was the Greatest here on my blog. But I'm only going to offer the giveaway to teachers and librarians with the hope that I can help get this book on a classroom or school library shelf. In order to enter the giveaway, you will need to provide a work email address that proves you work for a school, which is the email address I will use to notify you if you win. What a wonderful event! I love Jason Reynolds's work--I've passed around the book of art and poetry he did with Jason Griffin (My Name Is Jason. Mine Too) in my Adolescent Lit course--almost everyone has read it now. I had wondered if the cover of his new novel would be a censorship issue, and it sounds like it is. I also love the cover though. Thanks for sharing and doing this giveaway. My school is a private school, so I know I'll be able to place the book if I should win, Beth. Thanks for sharing about it. I did think that maybe it was an adult mystery since you said it was only for teachers and librarians. Too bad about the cover.